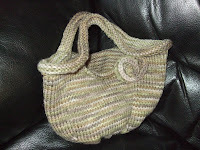 My first felting project - a gorgeous tote for any occasion using only knit stitches. Cast on 120 stitches and place a marker at beginning of round. Place finished bag into a pillowcase to catch loose fibres and prevent clogging of washing machine. Wash at 40 degrees on a program that has a good cold rinse section. Pull into shape and dry flat.